Summerlin Arts Festival 2007 along with La Strada dell’Arte and Celebration of the Arts will start a weekend long arts event at Summerlin Centre Community Park from 10 a.m. to 5 p.m. on September 29 – 30. More than 120 amateur and professional artists will paint the sidewalks this weekend and sell their artwork. The outdoor arts festival will be free to attendees and include entertainers including the Academy of Nevada Ballet Theatre at 11 a.m., noon and 1 p.m. both days. Summerlin Las Vegas master planned community uses public sculpture for aesthetic and cultural beauty that Summerlin real estate has represented. Summerlin is also known for its trail system, Las Vegas golf course, parks and tree lined streets. The new homes for sale in Summerlin, Nevada real estate showcases different architecture styles to define the unique community look and feel. 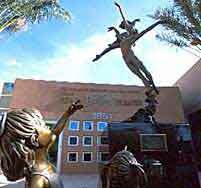 Archie Held, A southern California artist, has on display a 15 foot bronze sculpture at the Howard Hughes Plaza first office building. 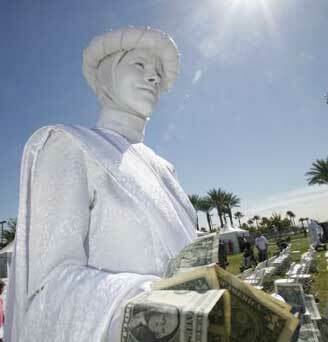 To celebrate the new corporate headquarters of The Howard Hughes Corp. had this “Unity” sculpture installed in 2001. Sarah Winnemucca, a Northern Paiute, is the artist for two pieces of public at at The Hills Center Business Park. These pieces include a three foot bronze sculpture. National Statuary Hall in the US Capital has the original commissioned sculpture by artist Benjamin Victor to represent Nevada.